As described in previous blog articles (“ESL Instruction Using Open Wonderland” and “NSF Funds Wonderland ESL Project at STCC“), WonderBuilders has been working with the English as a Second Language faculty at Springfield Technical Community College in Springfield, Massachusetts to deploy a Wonderland environment for English-language learning. This video, created as an update for the NSF project sponsors, provides an overview of the project. As part of our bachelor thesis, along with our Kinect module described last month, we developed a printscreen plugin for Open Wonderland. When the plugin is installed on a server, all connected users can choose if screenshots should be saved locally or on the server. If saved on the server, the pictures can be displayed in an automatically updated photo gallery. The update of the picture gallery is made with a shell script which is running as task in the background on the server. We had to implement it this way, as we did not find a way to save directly in the ‘docRoot’ folder in the ‘run’ directory. The shell script uses rsync to keep these two folders in sync. When pressing the ‘o’ key, a new screenshot will be taken and either saved locally or on the server. The reason why the key binding was done with ‘o’ is very simple: The printscreen key is not forwarded from the client to the module. The capture of the key event is done on a level before the module gets the event. 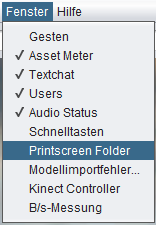 On this higher level, the “Print Screen” key is filtered and the module doesn’t get any event. Instead the message “Key is not allowed” appears. Version 3 of jMonkey will support taking screenshots by default, making it easier to capture the screen. On the server-side, the screenshots are saved in /.wonderland-server/0.5/run/content/images/screenshot/. This folder should be created by an administrator when installing the plugin. To run the photogallery, the content of the file ‘lightbox.zip’ needs to be extracted to /.wonderland-server/0.5/run/docRoot/lightbox/. This photo gallery shows all images stored in /.wonderland-server/0.5/run/docRoot/screenshot/. To update the photo gallery, we need a background task which copies the files from /.wonderland-server/0.5/run/content/images/screenshot/ to /.wonderland-server/0.5/run/docRoot/screenshot/. For example, the shell-script ‘copyScreenshot.sh’ can do the job. Anne Massey, a professor at Indiana University’s Kelley School of Business wrote to me to tell me about a recent article she co-authored with Akshay Bhagwatwar and Alan Dennis. In the paper, they describe their fascinating research on using Open Wonderland to enhance brainstorming. Here’s a pointer to their paper (PDF version) along with one of the images from the paper and the abstract. Bhagwatwar, A., Massey, A., & Dennis, A. R. (2013, January). In System Sciences (HICSS), 2013 46th Hawaii International Conference on (pp. 215-224). IEEE. 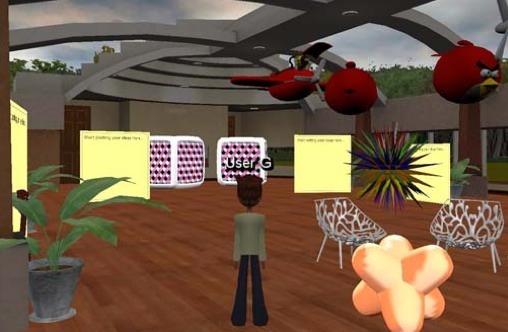 Three Dimensional Virtual Environments (VEs) have potential as platforms for collaboration. VEs enable members of teams, represented as avatars, to interact in a simulated world that can be designed in a variety of different ways. Research from cognitive psychology has shown that it is possible to manipulate non-conscious cognition and behavior through “priming”, a well-known phenomenon in which words and images are used to activate desired concepts in participants’ minds. In the context of team brainstorming, we posit that VEs can improve performance when specifically designed with visual objects intended to prime team members and enhance their creativity. Using Open Wonderland, an open source toolkit for creating 3D collaborative environments, we designed two VEs to support virtual team brainstorming: one looked like a generic conference hall while the other was visually designed to prime team members. Results show that when teams generated ideas in the creative VE, they generated significantly more and better quality ideas than when they worked in the generic one. In terms of key contributions, our study (1) demonstrates the efficacy of 3D VEs as collaboration spaces for facilitating team creativity, and (2) shows that the design of the VE itself can influence team performance. Configure a virtual server in the cloud or configure their router to point to a local machine. Manage a domain name or deal with fixed IPs or dynamic DNS. Install the necessary Open Wonderland modules and plugins and configure them. Deal with the fact that not everyone has Java correctly installed or Java Web Start working properly. More than a half of the posts on the Open Wonderland forum are regarding server configuration issues. People who only want a virtual world running must deal with many technical barriers that are not part of their business. By providing Open Wonderland as a product, this is the gap that the Cyramix team is aiming to fill. We are offering Open Wonderland virtual world hosting combined with technical support so that virtual world owners only have to focus on building, using, and sharing their worlds while we take care of the rest. We provide a client installer for Windows that comes with Java embedded as well as a launcher. For other platforms, we offer the standard web-based launch button. With the client installer, the user only has to download and install this one package and then type a world code. That’s all. The Open Wonderland client will launch faster than it does from a web-based launch page since a lot of code will already be downloaded and will not need to be verified each time the client is launched. For painters or photographers who want a virtual gallery as an extension of their website. For 3D artists who want visitors to experience their work in 3D. For presenters and educators who only need slideshows and limited document sharing. Multimedia presentations with slides and videos. Rich virtual galleries with biography. Education environment with full multimedia. Supports developer team meetings with real-time browser and code editing. Real-time document and spreadsheet collaboration using Google Docs or Libre Office. With time, we hope to be the top Open Wonderland contributor, making the platform more and more user friendly and bug free. 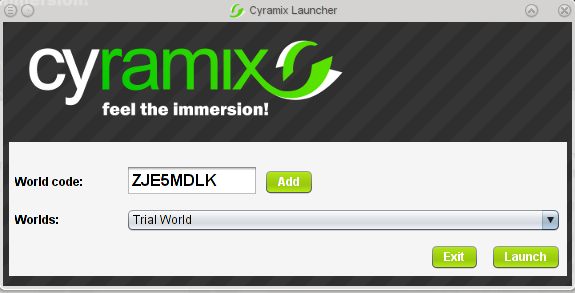 We invite everyone to check out our web page http://www.cyramix.com and test the trial world. We are just beginning and your comments would be much appreciated. Here you have the Cyramix video. 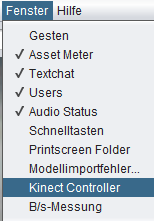 As part of our bachelor thesis, we developed a module called ‘kinect-control’. This module lets you control your avatar by using your body doing gestures. This module mainly runs on the client but necessary information will be transferred from the server to the client as needed. All the user needs to have is a connected Kinect device and the Kinect SDK Beta 2 installed. This means the module is only available for Windows x86/x64 clients. All other requirements will be shipped from server to client when logging in. This makes it easy for interested parties to use. These new files contain the DLL ‘KinectDLL.dll’ which is necessary for the connection between Open Wonderland and the Kinect. It is possible to extend the gestures recognized by this module. For this, you need to modify the file ‘gesturesBDA.txt’ located in ‘kinect-control-client.jar’ inside ‘kinect-control.jar’ using the software ‘KinectDTW‘. After this file contains your new gesture, you need to map this gesture to a keyboard-input. When gesture @Run is recognized, press key 16 (shift) and 87 (w) 2.5 seconds long. When gesture @Walk is recognized, press key 87 (w) for 3 seconds long. You are currently browsing the Wonderblog blog archives for August, 2013.